I tried to wait to open my results. In fact, I had made the decision to “drawer it” a few weeks before they arrived. In reality I opened the envelope before I got back to my house from the mailbox. It was devastating. I knew right then that had little chance of passing, even with 5’s for essays. So I began mourning my failure then and never really kept up with the anticipation of seeing the final results – although I certainly had enough hope to be crushed the day that those came out too. Anyway, I think that for first time takers, waiting is the better move. But the story is different for those of us doing this for the second GD time! The second time is 1000x worse. For me at least, the overwhelming anxiety and panic has been taking its toll since the day I started studying for the BAR the first time. It’s just never let up and since the results from BAR 1 it has only increased. So I’ve been thinking about it and I’ve decided that I have a choice to make. Is it worth the relief and incredible weight off my shoulders to risk the humility and depression that would certainly follow another defeat on the MBE section of the BAR? (In case you were wondering my MBE score was what destroyed me on the 1st exam. Its not the content, it’s my inability to test well on multiple choice tests… for a LAW exam!!! Is it just me or is the point of a law exam to show you know all avenues and options that you can take; it’s the argument and basis for ….. I am digressing, sorry). Where was I, oh yes, I feel like the potential for the relief of knowing I didn’t bomb the thing outweighs the potential defeat. So I say, first time takers hold off from opening it and, 2nd time takers, weight the options. If you are as miserable as I have been for the past year, you may decide it’s worth the risk to open it. Especially if it’s the MBE Bomb that has you running for cover. p.s. I hope the UNDENIABLERUTH does an update on this topic once the results are recieved. I’m sure you have a few friends who decide to wait and those who can’t help themselves. Thanks 2xT! I hope some test takers take me up on my offer to hold onto their results or just not open them themselves. My hat’s off to people like you who took the test again. That takes a lot of determination and dedication. If you change your mind and don’t want to see your MBE result’s early, feel free to send them my way. I hope you pass the second time around! I took the July 2008 Exam and I’m usually really bad at standardized tests. I got my MBE score in September – 124.2. I was devastated, I wasn’t sure at first whether that was the raw or scaled score. Nope, scaled score I think I was in the 16th percentile or something. I ended up passing with a 426.6 (passing is 410). 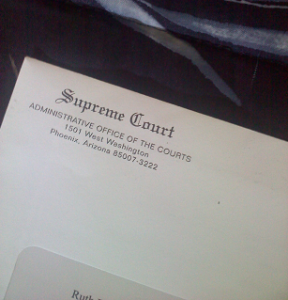 I was really considering asking the Supreme Court of Arizona to stop this ridiculous practice. My friend got like a 147 on the MBE and she passed with a 410.6. I’ve heard they’ve stopped doing this. It was way too nerve-wracking to get half my score to look at it. Oh good, finally. Opening that envelope was the worst thing I could have done between mid-September to mid-October haha. Agreed! I wasn’t going to torture myself by finding out what half my score is. I was happy to hear that they’ve stopped sending MBE scores in Arizona. Do you know if they have past Arizona Bar Exam questions? I just passed California and California releases both questions and model answers, and I wanted to know if they had the 2008 questions I took. Just for “milestone” sakes. I have no idea. I suspect you’ll have to ask the Arizona Supreme Court about that.